Static strain is holding a muscle contracted for a long time. The contracted muscle may put pressure on the local blood vessels (according to the individual's anatomy). A reduced blood supply can cause fatigue and a build up of lactic acid in the muscle. A contracted muscle can also put pressure on blood vessels, tendons and nerves that pass through or near it. The result is that the these suffer too - sometimes from poor blood supply. Sometimes nerves and tendons suffer from excessive wear and tear when the nerves or tendons pass through to another part of the body that is moving while the contracted muscles are putting pressure on them! 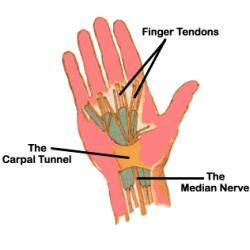 (This often happens in the wrist's carpal tunnel). Low level discomfort is typical. In most cases the body removes excess lactic acid and heals any light damage quickly when you rest. The danger starts when the strain is present all day and persistent across the working weeks and months. The flat keyboard causes static strain in the typical user. It causes static strain at the top of the arm in the shoulders, it causes static strain near the wrists in the lower arm as the hands are turned flat and in then turned to line up straight on the flat keyboard. It causes static strain as the middle fingers are curled up tightly and the little fingers are straightened out to touch the home-row keys. Other causes of static strain in the office include eye strain from looking at near objects for long periods without a break (that would be the screen to you and me) and neck strain if you have to twist your head to see the screen. A simple technique for reducing static-strain problems is to fidget and take little breaks to move and stretch and encourage good blood circulation at least every hour. When they told you to sit still they were not thinking of your health! Good posture is also important, in any case the standard flat keyboard will always be your enemy. Cold fingers, cold hands or tingly fingers is a common sign that the blood supply to the hands is - perhaps - weaker than normal. This may be normal for you BUT it does indicate that extra care to ensure a healthy blood supply to the hands should be taken. Tingly fingers is particularly interesting and should be reported to your doctor or physiotherapist. The aim to reduce wrist pronation was one of the reasons behind the MALTRON keyboard being designed with the sides being separated. Wrist adduction occurs with a normal flat keyboard because the rows are straight and the fingers don't line up on these straight rows unless the wrist is rotated. This rotation, where the wrist rotates the thumb and forefingers forward while the palm is faced down, is called adduction (so named because when the palms are faced up the hand moves to the centre). This adduction is required for most of the time that you are using a flat keyboard and means that the muscles involved will not be getting proper rest on a flat keyboard. To reduce adduction the MALTRON keyboard has split the keyboard into two halves so that you do not need to bring your hands together in the middle. Upper arm rotation occurs because the hands have to come close together in front of the body. To do this your upper arms rotate a little and bring the forearms closer to the middle. This uses muscles at the top of your arms, in your shoulders and in your neck. These muscles are used all the time and may easily cause shoulder and neck discomfort when a normal flat keyboard is used. As for wrist adduction, splitting the keyboard into two halves so that your hands do not have to go so far into the middle reduces upper arm rotation.